2 BR, 2 BA CONDO – DOWNTOWN BRECK – GREAT VIEWS Atrium 201 is a newly renovated deluxe condo that’s perfect for groups of up to seven people. 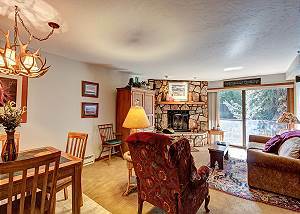 Great views of the mountains and plenty of space for the whole family make this an excellent winter or summer getaway. You’ll love the location, too: just a half-block walk to the ski area shuttle and two blocks to all the dining, shopping and entertainment of historic Main Street Breckenridge. Granite counter tops throughout and stainless-steel appliance give this condo an updated feel. The living area features a floor-to-ceiling cobblestone gas fireplace and large LCD TV — it’s the perfect place to relax after a long day on the slopes for drinks, conversation and a favorite movie. There’s even a balcony with excellent views and comfortable furniture. The fully equipped kitchen is ready for whipping up dinner and snacks, with seating for four at the table and three more at the bar. The king master suite and second bedroom with a twin-over-full bunk bed are cozy and nicely furnished. There’s complimentary Wi-Fi throughout the complex, as well as an underground heated garage, ski storage and laundry facilities. Guests can also enjoy a shared patio with gas grills and a large community hot tub. You can’t go wrong with Atrium 201 — it’s the right combination of space, location, amenities and price. Call us today to book your mountain getaway! SLEEPS 7: MAIN LEVEL: - King master suite: king bed, private bathroom with walk-in shower. - Bedroom 2: twin-over-full bunk bed. - Living room: queen sleeper sofa. - Bathroom: shower. SPECIAL UNIT NOTES – PLEASE READ - No Pets / No Smoking. - A $350 refundable damage deposit will be charged to credit card at check in. - Renters must be a minimum of 25 years old. - Parking: 1 garage space – 1 space total. - No air conditioning. All units include at least one fan. - Business and Occupational License #43370.